He was wincing. He was limping. He was five shots down with six holes to go. 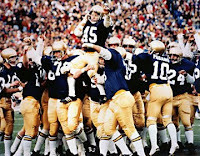 And, on the other channel, Rudy just got accepted to Notre Dame. You know the rest; at least, that is, with the re-run of Rudy. But you've seen Tiger counted out before too, and after an unbelievable eagle putt on 13, and a "lucky" (in his own words) chip in from the nasty rough, Tiger, now using a driver as a walking cane, was only one shot back. And the movie could not have cooperated better. For while Rudy was making his game ending tackle, and was carried off the field, Tiger was slowly walking up the 18th to hit his second shot. Rudy's father, friends and fans cheered, and we switched back just in time to see Tiger hit it on the green, some 35 feet from the hole. And when Tiger made that putt, to score his second eagle within six holes, he went from one shot back to one shot in the lead. No, they did not carry Tiger off the field as they did Rudy, for it was only the third round, and Woods would still have to limp around and hit miracles for eighteen holes tomorrow to win his 14th major, but I've seen the ending of Rudy fourteen times, and since that ultimate never-give-up movie always ends the same way, I'm betting that Eldrick, who has never lost a major when leading after 54 holes, will find a way to triumph too. The fact that it's Father's Day and Tiger's deceased dad will have to carry his gimpy son home from heaven will make this one all the more sweet.